The Trackman course list continues to grow, I presume due to the continued design work of Mike. 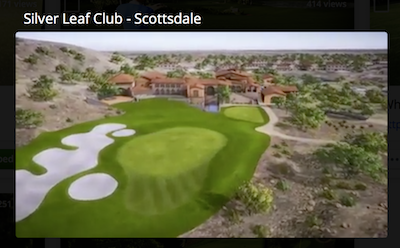 The Silverleaf club in Scottsdale is the latest addition.. I wonder if the "overlay technique" will ever get used by Mike? Perhaps TM doesn't want to get involved with having to license satellite imagery or something though.. The results from the overlay technique are so fantastic.. It really adds a whole new level of real world look to the latest 3rd party courses from the designers using it here. I’d be interested to know if this was done with Lidar. I was lucky enough to play this course last June and there are a lot of elevation changes that would be honorous to produce from scratch. If there is Lidar available there are a few courses nearby that would be great in PG. to behind the scenes, but you can bet he and Andrew are on top of it. They always have been. sure he is aware of it's possibilities and drawbacks. What are the drawbacks anyhow? Download size and licensing I’d imagine. Others? of many backward steps before going forward happens. I personally think the overlay technique looks bad from the player's point of view - great for distant screenshots which is what we normally see published and drool over, but not when actually playing. As NoPutt said, Mike put the facility ages ago and is well aware of it, yet didn't pursue it. I published screenshots using it in 2014 so it was capable back then, but I hated the blotchiness and decided not to do a tutorial on it. It's less blotchy now because Unity now can use 8192 resolution overlays (still too blotchy IMO) but I do recall the immense time it took to prepare the overlay for this use and feel that time is better spent using normal texturing techniques. The other negative - I want to play a course in real life at its best condition. Satellite images are rarely taken when a course in its best condition, so even more time is needed photoshop the overlay into best condition. If that is not spent, the course looks realistic, but in average or poor condition. 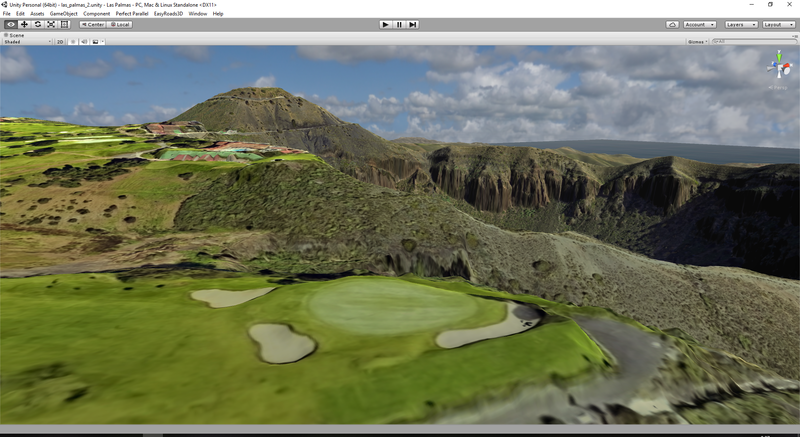 You can also use overlay image only in rough areas and areas outside the course. Overlay gives a very nice touch of realism that way too. Those are the parts that need overlay most anyway, I think. You just can't paint the world alone with the paint tool convincingly. The overlay works great on links courses where there is no uniformity to the appearance of fairways and greens. The more lush, manicured courses can look great with either technique. Trackman had openings for course designers so I bet Mike Jones didn't even have a hand in this. My take on the overlay situation is I think it looks great but you also probably need a great overlay to start with. If you have great textures though I hope people don't think it is necessary that any designers out there now MUST think it has to have one to be released or other people will think less of the course and designer. Yup, just textures. I just made them from a base texture I found on Google and some gr8 tuts made by DPRoberts.I don't have Photoshop, wish I did. My plot was 2900x2900 and it looks like for overlay would look better if you have 1500x1500. Not having PS and having colorblindess, kind of hurts but I am exploring the overlay on Inverness, it's 2000x2000, which I have 16 holes done but I am finding it harder to get the spare time to do all this. I don't disagree with wanting to play something when it's "the best", but I think there is a distinction between a course looking its best and being totally perfect looking. The random little elements and lines and particularly coloration variations are my favorite part of blending in some overlay. Something in the middle of the two concepts is definitely best and I think we've sort of seen that with the fantastic designer work here using this method already. 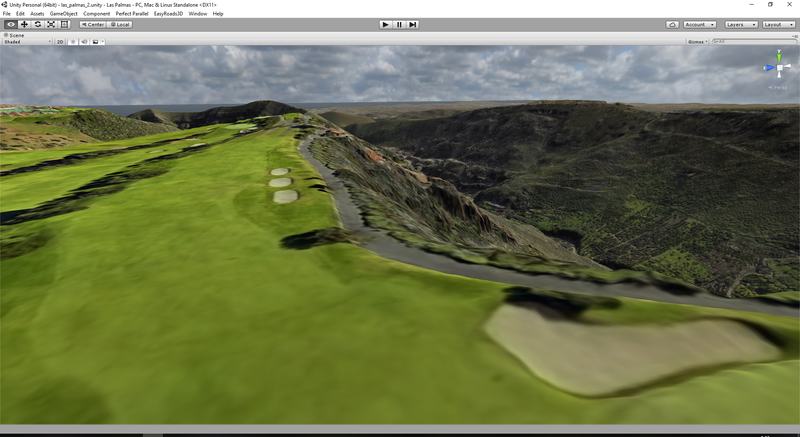 I'm not sure the "how" of the build out on Chambers Bay, but whatever technique was used with the base texturing and then grasses on top, really makes those grassy hills around the course look super realistic and awesome. I've noticed in recent months that some designers are really trying to push the visuals. This is always welcome IF performance is not seriously compromised. Frame rate drops will adversely impact real time mouse swingers due to the forced tempo calculation. 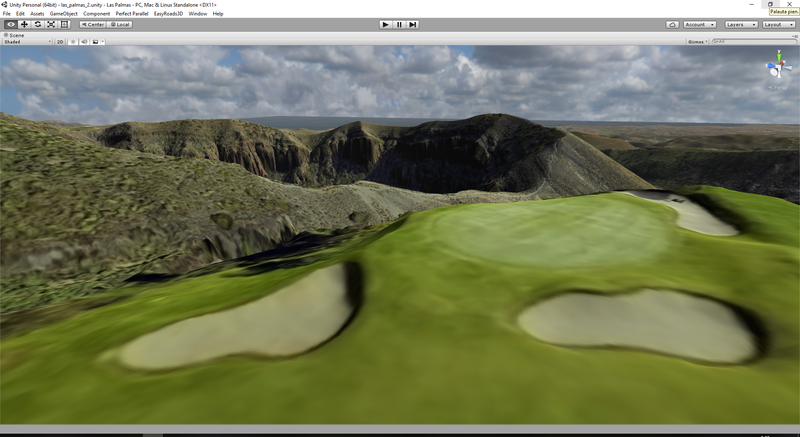 As in any other game engine there are methods that should be used to optimize rendering in an open world level (golf course). Using an uncompressed 8192x8192 texture instantly allocates 256MB of VRAM at all times since it is mapped to the entire terrain. Foliage objects (Speedtree or other) should have proper LOD's setup and adjusted as needed. Also, the modular style buildings used on many courses are horrendous with flickering materials. Not only are these an eyesore also resource hungry with inherent seaming issues. 4096x4096 should be more than acceptable to blend the underlying color tones from the satellite image into terrain materials. I've long been a proponent of gameplay over glitz. In JNPG the impact of FPS drops on gameplay is a real killer and there is no excuse for it because performance can be optimized by the designer. Unity's Profiler tool will provide performance numbers for GPU/CPU/RAM/VRAM/Audio, etc. There are also general, performance related practices that can be followed to help reduce rendering loads. *Note, the link below pertains to the 2018.x versions of Unity but still good guidelines to follow. Lastly, a course designer should target mid range system specs if they want their course to be enjoyed by most players. If you have a beast of a system, take advantage of the Profiler tool for performance stats and optimize as needed. It's 2019 and sometimes PG (older courses and situations) can still look like it's from 2005. Even Trackman is now recommending GTX 1080+ for GPU's, and the 1000 series isn't even the current generation at this point. At some point, it's time to keep pushing forward and evolving here. I think the visuals focus by designers is literally the only/best thing going for PG in the last calendar year honestly. I agree a balance is important, but I have to say that I've had phenomenal performance on basically all of the latest releases that were all totally gorgeous design/visuals work. I think the designers are bored and trying to push the limits in some way and explore new avenues for course appearance. Intelligently, there are several discussions about optimization going on. The overlay being used is typically a compressed 8192*8192 and is about 48 MB. It is significantly important over a 4096x4096 for any mow line type detail or dead grass type grunge in select locations. As far as buildings, I agree and somewhat contributed to the cause. I totally would like to partner with Justin or Larry and push out a house set with like 12-16 houses built off of 2 texture sheets. People have been using materials without any regard for draw calls in that regard. Additionally, modular building in Unity should utilize a mesh combine at completion but I don't think many do that. Lastly, do we have access to the Profiler in the free version of Unity or do you need the Pro version? The only thing I ever look at it batches and Tris in the "stats" window in the game view. The eye candy and GPU cards arguments have been well discussed over the past few years. The group of designers past and present are very open to new ideas and willing to work in that direction of what players are looking for. The real problem is Unity and the hardware in our computers that needs updating faster than our budgets can allow. Hopefully we can meet in the middle of this and satisfy a majority here. I really don't understand what you mean blotchiness in today's overlays. 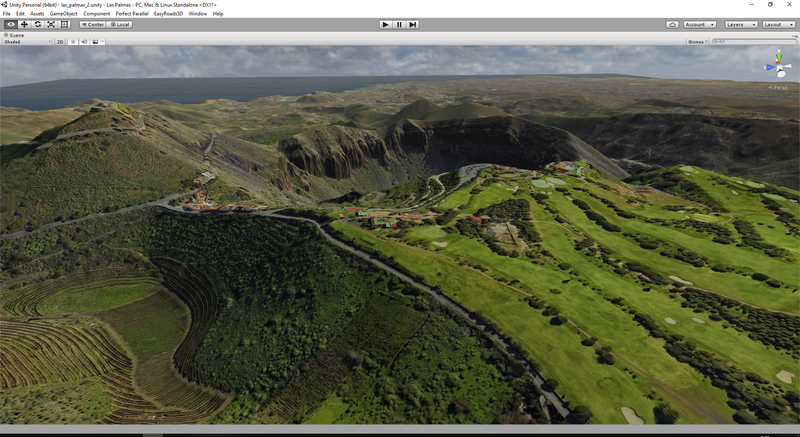 Put terrain below up last night, Las Palmas course in Canary Islands. The overlay is definitely the best colour source for the textures. I think it's just elegal to use these overlays in commercial courses and that's one reason TM doesn't use them. I have discussed with Mike and he is very well aware of this technique. It's also faster to do courses in the old way. And quality stays about the same.